A visit to a major museum or historical site in New York, Boston, L.A., or any other one of America’s cultural hotspots can always be divided into two categories: the time you wait to buy a ticket, and the time you actually spend at the attraction. All too often these categories are equal, or the former is greater than the latter. With such long lines, what should be a memorable visit to a world-famous site becomes a dreaded obligation. In order to avoid waiting in line like everybody else, consider buying a CityPass before your next trip to one of the big cities. 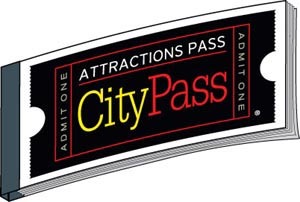 A CityPass is a condensed booklet of everything you need to get around the city with speed and ease, including tickets to main attractions, transportation information, and discount coupons. Not only does this simplify and economize your time, but the CityPass saves you money, too. The New York CityPass, for example, provides tickets to 6 of the city’s top sites, including the Met, the Moma, and the Statue of Liberty, and costs $74, compared to the $134 it would cost to buy individual regular-priced admissions tickets to each of the 6 sites. The CityPass is valid for 9 consecutive days and begins whatever day you first use it. So if you’ve only got a weekend, make sure you will have time to visit enough sites to make purchasing the pass financially worth it. Prices vary by city, and there are lowered prices for a childrens’ CityPass.